Prediction is a difficult business at the best of times, but the difficulties seem to change from one era to another. Just now, at least for me, the biggest challenge is staying in front of the headlines. So far, the crash of 2015 is running precisely to spec. Smaller companies in the energy sector are being hammered by the plunging price of oil, while the banking industry insists that it’s not in trouble—those of my readers who recall identical expressions of misplaced confidence on the part of bankers in news stories just before the 2008 real estate crash will know just how seriously to take such claims. No doubt there will shortly be other promoters scrambling for whatever government subsidies and private investment funds might be available for whatever revolutionary new energy breakthrough (ahem) will take the place of hydrofractured shales as America’s favorite reason to do nothing. I admit to a certain feeling of disappointment, though, in the sheer lack of imagination displayed so far in that competition. OTEC and molten-salt fission reactors were already being lauded as America’s energy salvation back when I was in high school: my junior year, I think it was, energy was the topic du jour for the local high school debate league, and we discussed those technologies at length. So did plenty of more qualified people, which is why both of them—and quite a few other superficially plausible technologies—never made it off the drawing board. Something else came in for discussion that same year, and it’s a story with more than a little relevance to the current situation. A team from another school in the south Seattle suburbs had a brainstorm, did some frantic research right before a big debate tournament, and showed up with data claiming to prove that legions of squirrels running in squirrel cages, powering little generators, could produce America’s electricity. Since no one else happened to have thought of that gimmick, none of the other teams had evidence to refute them, and they swept the tournament. By the next tournament, of course, everyone else had crunched the numbers and proceeded to stomp the squirrel promoters, but for years to come the phrase “squirrel case” saw use in local debate circles as the standard term for a crackpot proposal backed with seemingly plausible data. The OTEC plants and molten-salt reactors currently being hawked via the media are squirrel cases in exactly the same sense; they sound plausible as long as you don’t actually crunch the numbers and see whether they’re economically and thermodynamically viable. The same thing was true of the fracking bubble that’s messily imploding around us right now, not to mention the ethanol and biodiesel projects, the hydrogen economy, and the various other glittery excuses that have occupied so much useless space in the collective conversation of our time. So, it has to be said, do the more enthusiastic claims being made for renewable energy just now. Don’t get me wrong, I’m a great fan of renewable energy. When extracting fossil carbon from the earth stops being economically viable—a point that may arrive a good deal sooner than many people expect—renewables are what we’ll have left, and the modest but real energy inputs that can be gotten from renewable sources when they don’t receive energy subsidies from fossil fuels could make things significantly better for our descendants. The fact remains that in the absence of subsidies from fossil fuels, renewables won’t support the absurdly extravagant energy consumption that props up what passes for an ordinary middle class lifestyle in the industrial world these days. That’s the pterodactyl in the ointment, the awkward detail that most people even in the greenest of green circles don’t want to discuss. Force the issue into a conversation, and one of the more common responses you’ll get is the exasperated outburst “But there has to be something.” Now of course this simply isn’t true; no law of nature, no special providence, no parade of marching squirrels assures us that we can go ahead and use as much energy as we want in the serene assurance that more will always be waiting for us. It’s hard to think of a more absurd delusion, and the fact that a great many people making such claims insist on their superior rationality and pragmatism just adds icing to the cake. Let’s go ahead and say it in so many words: there doesn’t have to be a replacement for fossil fuels. In point of fact, there’s good reason to think that no such replacement exists anywhere in the small corner of the universe accessible to us, and once fossil fuels are gone, the rest of human history will be spent in a world that doesn’t have the kind of lavish energy resources we’re used to having. Concentrations of energy, like all other natural resources, follow what’s known as the power law, the rule—applicable across an astonishingly broad spectrum of phenomena—that whatever’s ten times as concentrated is approximately ten times as rare. At the dawn of the industrial age, the reserves of fossil fuel in the Earth’s crust were the richest trove of stored energy on the planet, and of course fossil fuel extraction focused on the richest and most easily accessible prizes first, just as quickly as they could be found. Those are gone now. Since 2005, when conventional petroleum production peaked worldwide, the industrial world has been engaged in what amounts to a frantic game of make-believe, pretending that scraping the bottom of the oil barrel proves that the barrel is still full. Every half-baked scheme for producing liquid fuels got flooded with as much cheap credit as its promoters could squander. Some of those—biodiesel and cellulosic ethanol come to mind—turned out to be money pits so abysmal that even a tide of freshly printed money couldn’t do much more than gurgle on the way down; others—above all, shale fracking and tar sand mining—were able to maintain a pretense of profitability for a while, with government subsidies, junk bonds, loans from clueless banks, and round after round of economic stimulus from central banks over much of the world serving to prop up industries that, in the final analysis, were never economically viable in the first place. The collapse in the price of oil that began this June put paid to that era of make-believe. The causes of the oil crash are complex, but back of them all, I suggest, is a straightforward bit of economics that almost everyone’s been trying to avoid for a decade now. To maintain economic production at any given level, the global economy has to produce enough real wealth—not, please note, enough money, but enough actual goods and services—to cover resource extraction, the manufacture and replacement of the whole stock of nonfinancial capital goods, and whatever level of economic waste is considered socially and politically necessary. If the amount of real wealth needed to keep extracting resources at a given rate goes up steeply, the rest of the economy won’t escape the consequences: somewhere or other, something has to give. The economic history of the last decade is precisely the story of what gave in what order, or to put it another way, how the industrial world threw everything in sight under the bus to keep liquid fuel production around its 2005 peak. Infrastructure was abandoned to malign neglect, the last of the industrial world’s factory jobs got offshored to Third World sweatshops, standards of living for most people dropped steadily—well, you can fill in the blanks as well as I can. Consumption remained relatively high only because central banks flooded the global economy with limitless cheap credit, while the US government filled the gap between soaring government expenditures and flat or shrinking tax receipts by the simple equivalent of having the Fed print enough money each month to cover the federal deficit. All these things were justified by the presupposition that the global economy was just going through a temporary rough patch, and normal growth would return any day now. But normal growth has not returned. It’s not going to return, either, because it was only “normal” in an era when cheap abundant fossil fuels greased the wheels of every kind of economic activity. As I noted in a blog post here back in 2007, the inevitable consequence of soaring oil prices is what economists call demand destruction: less formally, the process by which people who can’t afford oil stop using it, bringing the price back down. Since what’s driving the price of oil up isn’t merely market factors, but the hard geological realities of depletion, not everyone who got forced out of the market when the price was high can get back into it when the price is low—gas at $2 a gallon doesn’t matter if your job scavenging abandoned houses doesn’t pay enough for you to cover the costs of a car, and let’s not even talk about how much longer the local government can afford to maintain streets in driveable condition. Demand destruction sounds very abstract. In practice, though, it’s all too brutally concrete: a rising tide of job losses, business failures, slumping standards of living, cutbacks to every kind of government service at every level, and so on down the litany of decline that’s become part of everyday life in the industrial world over the last decade—leaving aside, that is, the privileged few who have been sheltered from those changes so far. Unless I miss my guess, we’re going to see those same changes shift into overdrive in the months and years ahead. The attempt to boost the world out of its deepening slump by flooding the planet with cheap credit has failed; the global economy is choking on a supersized meal of unpayable IOUs and failed investments; stock markets and other venues for the exchange of paper wealth are so thoroughly gimmicked that they’ve become completely detached from the real economy of goods and services, and the real economy is headed south in a hurry. Those unwelcome realities are going to constrain any attempt by the readers of this blog to follow up on the proposal I made in last week’s post, and take constructive action in the face of the crisis that’s now upon us. The energy situation here in the US could have been helped substantially if conservation measures and homescale renewables had received any kind of significant support from the oh-so-allegedly-green Democratic party, back when it still had enough clout in Congress to matter; the economic situation would be nowhere near as dire if governments and central banks had bitten the bullet and dealt with the crisis of our time in 2008 or thereafter, rather than papering things over with economic policies that assumed that enough money could negate the laws of physics and geology. At this point, it’s much too late for any sort of collective action on either of those fronts—and of course the political will needed to do anything meaningful about either one went missing in action at the end of the 1970s and hasn’t been seen since. Thus all of us will have to cope with a world in which the cost of energy suffers from drastic and economically devastating swings, and the sort of localized infrastructure that could cushion the impact of those swings wasn’t built in time. All of us will also have to cope with a global economy in disarray, in which bank failures, currency crises, credit shortages, and crisis measures imposed by government fiat will take the place of the familiar workings of a market economy. Those are baked into the cake at this point, and what individuals, families, and community groups will be able to do in the years ahead will be constrained by the limits those transformations impose. Those of my readers who still have a steady income and a home they expect to be able to keep would still be well advised to doublecheck their insulation and weatherstripping, install solar water heating and other homescale renewable energy technologies, and turn the back lawn into a vegetable garden with room for a chicken coop, if by any chance they haven’t taken these sensible steps already. A great many of my readers don’t have such options, and at this point, it may be a long time before such options are readily available again. This is crunch time, folks; unless I’m very much mistaken, we’re on the brink of a historical inflection point like the ones in 1789 and 1914, one of the watersheds of time after which nothing will ever be the same again. There’s still much that can be done in other spheres, and I’ll be discussing some of those things in upcoming posts. In terms of energy and the economy, though, I suspect that for a lot of us, the preparations we’re going to be able to make are the ones we’ve already made, and a great many people whose plans depend on having a stable income and its associated perks and privileges may find themselves scrambling for options when the unraveling of the economy leaves them without one. Those of my readers who have been putting off the big changes that might make them more secure in hard times may be facing the hard decision of making those changes now, in a hurry, or facing the crisis of our age in the location and situation they’re in right now. Those who’ve gone ahead and made the changes—well, you know as well as I do that it’s time to review your plans, doublecheck the details, batten down the hatches and get ready to weather the storm. One of the entertainments to be expected as the year draws on and the crisis bears down on us all, though, is a profusion of squirrel cases of the sort discussed toward the beginning of this essay. It’s an interesting regularity of history that the closer to disaster a society in decline becomes, the more grandiose, triumphalist, and detached from the grubby realities its fantasies generally get. I’m thinking here of the essay on military affairs from the last years of the Roman world that’s crammed full of hopelessly unworkable war machines, and of the final, gargantuan round of Mayan pyramids built on the eve of the lowland classic collapse. The habit of doubling down in the face of self-induced catastrophe seems to be deeply engrained in the human psyche, and I don’t doubt for a moment that we’ll see some world-class examples of the phenomenon in the years immediately ahead. That said, the squirrel cases mentioned earlier—the OTEC and molten-salt fission proposals—suffer from a disappointing lack of imagination. If our society is going to indulge in delusional daydreams as it topples over the edge of crisis, couldn’t we at least see some proposals that haven’t been rehashed since I was in high school? I can only think of one such daydream that has the hallucinatory quality our current circumstances deserve; yes, that would be the proposal, being made quite seriously in the future-oriented media just now, that we can solve all our energy problems by mining helium-3 on the Moon and ship it to Earth to fuel fusion power plants we have absolutely no idea how to build yet. As faith-based cheerleading for vaporware, which is of course what those claims are, they set a very high standard—but it’s a standard that will doubtless be reached and exceeded in due time. That said, I think the media may need some help launching the march of the squirrels just mentioned, and the readers of this blog proved a good long time ago that they have more than enough imagination to meet that pressing need. Therefore I’m delighted to announce a new contest here on The Archdruid Report, the Great Squirrel Case Challenge of 2015. The goal is to come up with the most absurd new energy technology you can think of, and write either the giddily dishonest corporate press release or the absurdly sycophantic media article announcing it to the world. If you or a friend can Photoshop an image or two of your proposed nonsolution to the world’s energy needs, that’s all the better. Post your press release or media article on your blog if you have one; if you don’t, you can get one for free from Blogspot or Wordpress. Post a link to your piece in the comments section of this blog. As for the wonderful new energy breakthrough you’ll be lauding so uncritically, why, that’s up to you. Biodiesel plants using investment bankers as their primary feedstock? A vast crank hooked to the Moon, running a global system of belts and pulleys? An undertaking of great energy profit, to misquite the famous ad from the South Sea Bubble, but no one to know what it is? Let your imagination run wild; no matter how giddy you get, as the failure of the fracking bubble becomes impossible to ignore, the mass media and a great many of our fellow hominids are go much further along the track of the marching squirrels than you will. In not unrelated news, I’m delighted to report that the second volume of stories to come out of this blog’s 2014 Space Bats challenge is now available in ebook formats, and will shortly be out in print as well. 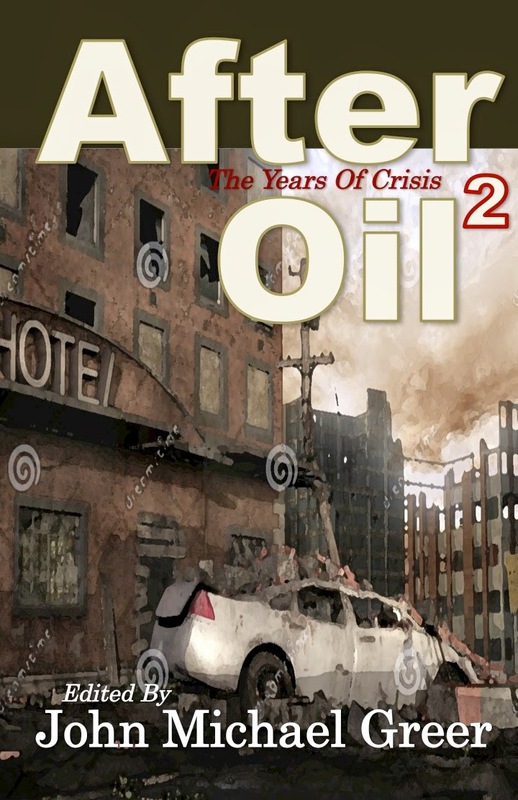 After Oil 2: The Years of Crisis features a dozen original short stories set in the near future, as industrial civilization slams face first into the limits to growth. Those of my readers who followed the original contest already know that this is a first-rate collection of deindustrial SF; as for the rest of you—why, youre in for a treat. Click here to order a copy.